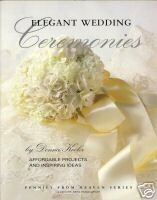 Elegant Wedding Ceremonies by Donna Kooler "Now that you have the happy task of planning a weddingâwe have designed this book to answer your questions about practical decisions, as well as to awaken you to the limitless possibilitiesâof your wedding” Copyright 2001 by Leisure Arts Book Description The paperback book is in good condition. The book has shelf wear on the edges and corners. No notes written inside. There is a crease on the back cover caused by a former reader flipping through the pages. Profusely illustrated in color with a few black and white drawings. CHAPTERS: The Perfect Wedding for You Designing Your Wedding Sending the Invitation Setting the Stage The Perfect Flowers Bridal Attire Special Touches Celebrating the Newlyweds Resources and Suppliers Photo Credits Index All books are vintage items and soldâAS IS. I attempt to represent my goods as honestly as possible, but sometimes something will get by. If you have any doubts about an item, E-MAIL ME! I want to make sure that you will be pleased with your purchase. I will make a refund as merchandise credit; buyer pays for return shipments.